India vs Australia 4th Test Sydney: India all-rounder Ravindra Jadeja broke into his signature sword dance on getting to fifty. India vs Australia 4th Test Sydney: India all-rounder Ravindra Jadeja broke into his signature sword dance on getting to fifty. He got to his fifty off 89 deliveries. His innings was laced with a solitary four and a six. But, the sword dance must have been the moment his fans had been waiting for. He hit the ball straight down the ground and picked up a single to get to his fifty off Nathan Lyon. The two batsmen (Rishabh Pant and Ravindra Jadeja) have already stitched a partnership in excess of 150 runs which has put India on the box seat. 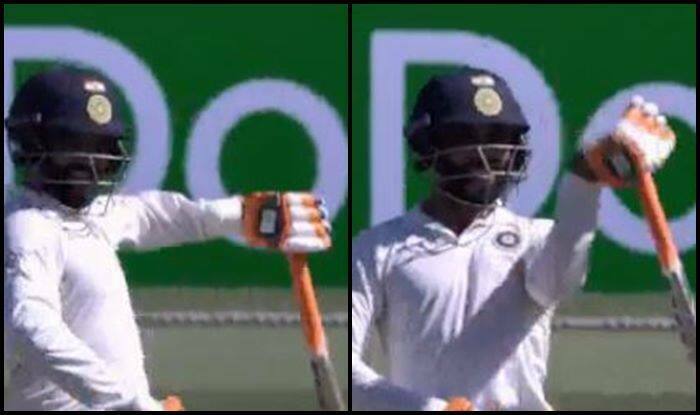 Here is the moment when Jadeja launched his customary sword dance after getting to his 10th Test match fifty. Earlier, India wicketkeeper Rishabh Pant brought up his second Test century in 137 balls on Day 2 of the 4th Test at Sydney Cricket Ground and set the stage on fire. It came at a great pace as was the need of the hour as India was looking to declare the innings with a score in excess of 500 as they did not want to bat another time in the Test. Things went according to plan as Pant upped the ante once Cheteshwar Pujara departed seven runs short of his fourth double hundred. Ravindra Jadeja joined the other southpaw and they stepped up the accelerator as Pant played a few adventurous shots and it came off beautifully well as he brought up his second double century after he has got his maiden Test century in England. At the time of filing the copy, India was at a mammoth 568/6 with Rishabh Pant on 139* and Jadeja was giving him company at the other end was on 50*. India would now seriously consider a declaration as no other milestone is on the cards and they have got a sizable first innings total which puts them on the driver’s seat and takes the hosts out of the series.